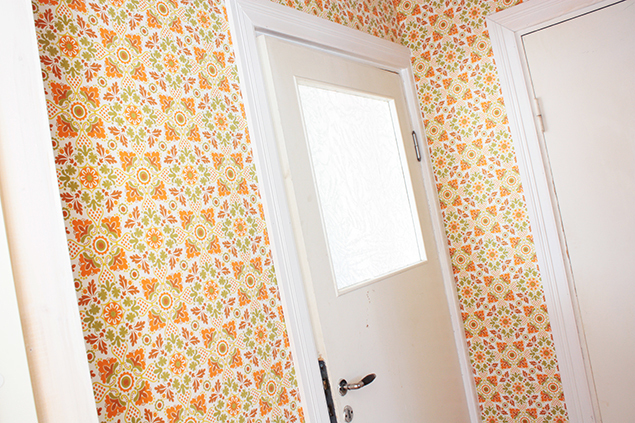 I love it when you have an idea you've been waiting to realize forever and then you finally get around doing it and it turns out just as you planned; right - we put up wallpaper in the small hall between the back porch, kitchen, laundry closet and bathroom-in-the-making. As it is pretty much just a walk-trough space with four doors no one ever really stays in I wanted the walls to be bright, colorful and heavily patterned, kind of like a piece of candy you can spot from the other more calm rooms. En karamell. 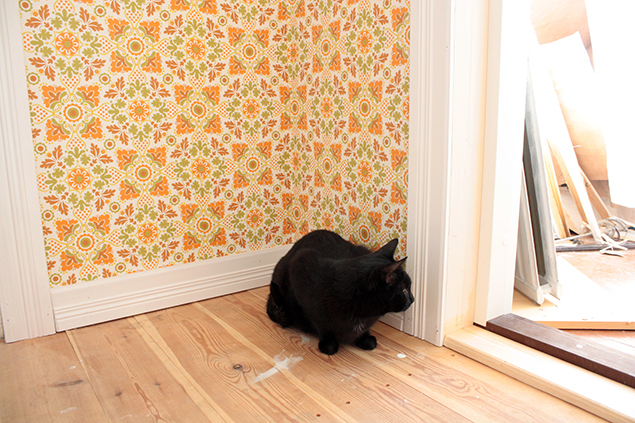 And I wanted it to be this exact wallpaper, Vadelma (translated: raspberry). Kind of looking like something people would have put up during a previous renovation in the sixties that we would have discovered under the eighties wall paper we torn away. 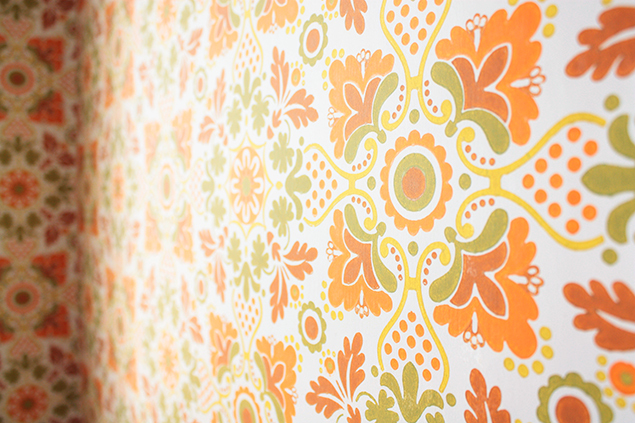 Like most of our other wall paper also Vadelma is from Tapettitalo, a company that sells old and classic patterns from past decades and centuries as well as vintage dead stock of old their factory rolls. The doors are old, we've moved them around a bit from room to room, opening to opening. I know this post totally makes it seem like I would have been putting these up but I so did not this time (phew), the handy men and Eddi did it. Bonus pic: You can see the bathroom coming along in the background. But that is still for laters, as is the kitchen... but looking pretty good so far, right? Awwww, I already love that!! Great wallpaper! I wouldn't want it in my living-room, but for a corridor it's simply perfect! Makes me happy! It really pops! Although I enjoy our subtly painted bare walls I can imagine looking at this even for a few seconds would really brighten up your day. I LOVE this wallpaper! It makes me so happy, like a little area full of happiness. The whole place is looking so good! I too love it when an idea comes into fruition. 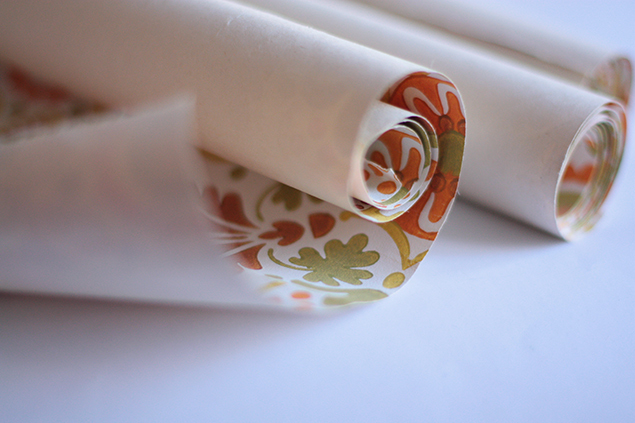 Wallpaper is tricky, and this is perfect! 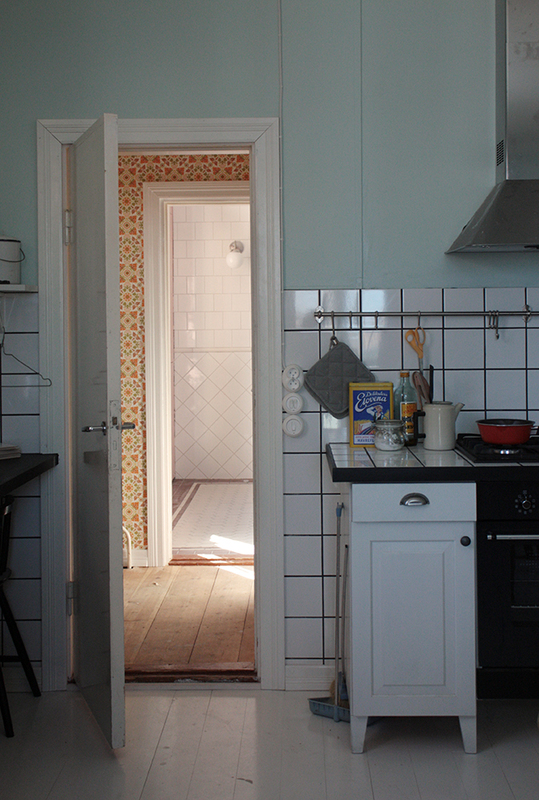 Can't wait to see the kitchen (a space I'm currently working on myself.. And I just love kitchens) and the bathroom! Looking at these snippets I suspect they are going to be stunning! I'd love me some handy men, but unfortunately, my man is very handy with computers but not with diy, I'm the one holding the hammer and nails in our home.. Oh well.. It looks great, I can imagine you are happy with it! I love it! It is something I haven't seen before I guess because we haven't had the need to renovate lately. Tapettitalo is just a treasure house! This is coming along nicely! I love the sneak peak of your kitchen (tha stove is amazing!) and the look of the raw floor boards in the hall. What do you plan for them? Hope you'll enjoy the easter holidays. wow it's looking fabulous, you must be so pleased with how it's all coming together :) very exciting! but Ulrika let me please ask you something. Are those floorboards painted white, the flooring for your kitchen? What did you use to keep them from damage??? Miss M : I totally adore tapettitalo! 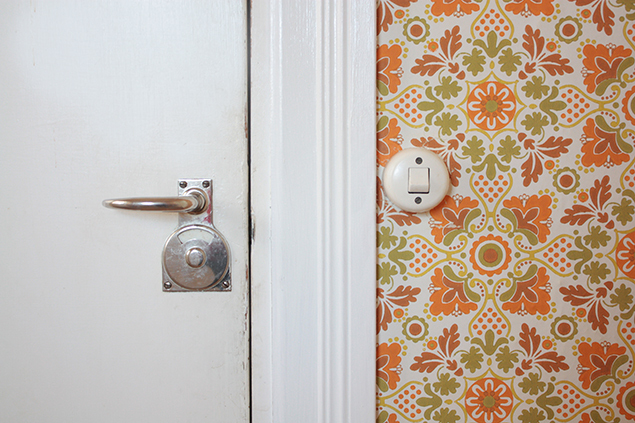 I saw this wallpaper in a mag some years ago and have had this thought ever since. Christina : We will scrub the floor boards in the little hall with linseed soap. It gives a nice touch to wooden floors; we will not paint them. Raikkaan pirteä tapetti tuo Vadelma!